Are you feeling oh so hot? Resist the temptation to drive up your summer electricity bill oh so high by overusing your air conditioning system. Instead, try one of these 10 simple tips, designed to help you save money on A/C and still keep cool at home. Dehumidify. The typical humid air of summer tends to hold in the heat, even indoors. Counteract that seasonal moist, warm air with a dehumidifier. This energy-efficient device helps to keep your home’s relative humidity at recommended comfort levels of 40-60 percent. Shade the windows. Hang window shades or thermal curtains to help insulate the glass against the outdoor warmth, especially in windows which are facing south or west. An even better trick is to shade the windows from the outside, with exterior curtains or awnings. 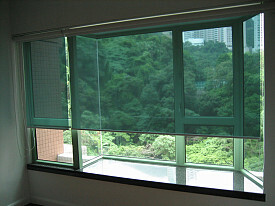 Yet another option: apply a sunlight-reducing window film. Maintain your air conditioner. Clean or change the air conditioning’s filter regularly, as per the manufacturer’s instructions. Keep the outdoor unit free of foliage and debris. Repair any leaks in your ductwork and add insulation so that you will get the most out of the cooled air which your A/C system is pumping out. Replace your old air conditioner. When your trusty old A/C is on its last legs (average lifespan is 10-15 years), find a pro to replace the air conditioner with an Energy Star certified model. Alternatively, consider installing a heat pump to use for both cooling and heating, if you live in an area of the country with a moderate climate. Install overhead fans. Running an overhead fan will circulate cooled air much more effectively. This means that you can reduce your air conditioning and still get the same amount of cool. While supplementing one cooling appliance with another may seem counter-intuitive, fans require much less energy than your A/C system. Turn down your water heater. Calling all you apartment and condo dwellers! If your water heater is “conveniently” positioned right next to your living space, that tank filled with hot H2O will act just like a heater and crank up the temperature in the surrounding area. Turn down the water temperature to cool your home and save money on A/C, too. Drink – a lot! Keep an insulated bottle of cool, refreshing water by your side as you work or relax at home. Staying hydrated will make you feel cooler and more alert in hot weather. Add a few citrus slices or sprigs of mint to your beverage, if you wish. Avoid sugared or caffeinated drinks, though. Refresh yourself with a spray bottle. Here’s another simple – and cheap – way to use the cooling power of water. Keep a full plant mister in the refrigerator. Give yourself a refreshing spritz every now and then. Best places to spray: your face and pulse points like the inside of your wrists or knees and the back of your neck. Use your oven the smart way. Try to use the oven as little as possible during hot weather. If you must roast or bake, do it either early in the morning or late in the evening ... and open the kitchen window wide. Bake several dishes at once for more efficient heat usage. Plant a hedge. Granted, this is a long-term solution but if you love your home and plan to be there for years to come, it’s well worthwhile. (Even if you’d like to sell your property in a few years, attractive greenery will add curb appeal.) Shrubs or trees planted about 3 feet from the exterior walls will act as natural insulation, sheltering your house from heat in summer and cold in winter.